Sensory pathways include only those routes which conduct information to the conscious cortex of the brain. However, we will use the term in its more loosely and commonly applied context to include input from all receptors, whether their signals reach the conscious level or not. 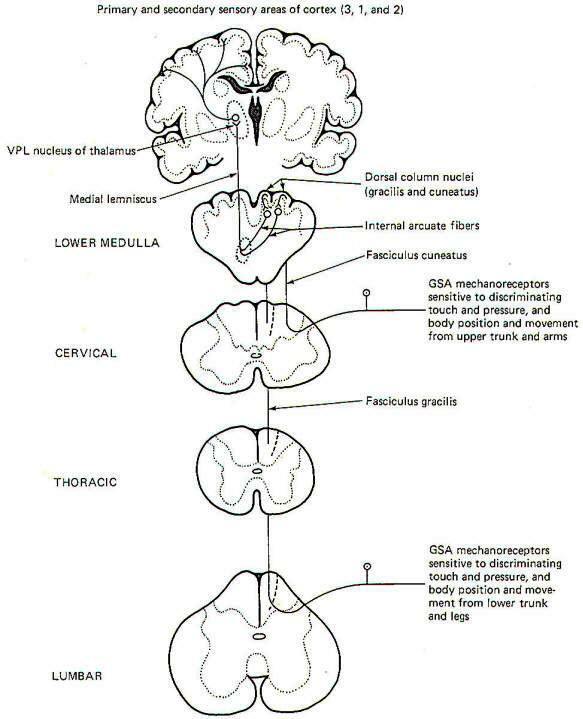 Pain and temperature information from general somatic receptors is conducted over small-diameter (type A delta and type C) GSA fibers of the spinal nerves into the posterior horn of the spinal cord gray matter (Fig-1). These are monopolar neurons with cell bodies in the posterior root ganglia. After entering the cord, the fibers pass up or down in the dorsolateral tract, located between the tip of the posterior horn and the surface of the spinal cord near the posterior root, before finally synapsing in laminae III and IV. Second-order neurons from these synapses cross over to the opposite side of the cord in the anterior white commissure, where they turn upward as the lateral spinothalamic tract (LSTT). At higher pontine levels this tract comes to lie close to the medial lemniscus, with which it travels to the ventral posterior lateral nucleus (VPL) of the thalamus. Some fibers of this tract don't enter the thalamus but end instead in the brainstem reticular formation. After synapsing in the thalamus, third-order neurons enter the posterior third of the internal capsule, pass through the corona radiata, and terminate in the primary and secondary sensory areas of the parietal lobe cortex (areas 3,1, and 2). Notice that regardless of the level of entry into the spinal cord, pain and temperature stimulation delivered to one side of the body registers in the cerebral cortex of the opposite side. Pain sensation is often confusingly labeled "fast" or "slow" depending on the type of fiber which conducts the impulse and the speed with which the signal consciously registers. Fast pain, often called sharp or pricking pain, is usually conducted to the CNS over type A delta fibers. These ultimately excite lateral spinothalamic tract fibers which go directly to the VPL of the thalamus on the contralateral side. From here third-order fibers project to the cerebral cortex where they are somatotopically organized and sharply localized. Somatotopic organization means that each minute area of the sensory cortex receives input from a distinct peripheral area. A person can sharply localize a pain if he is able to tell exactly where it is originating. Slow pain, often called burning pain, is conducted to the CNS over smaller-diameter type C fibers. After entering the cord these fibers stimulate lateral spinothalamic tract neurons which send collaterals into the brainstem reticular formation. Fibers from the reticular formation diffusely project to the thalamus, hypothalamus, and possibly other areas as well, perhaps giving rise to the emotional component of pain. Pain signals following this route are poorly localized. A dermatome is the area of skin supplied by the afferent fibers in the posterior root of a single spinal nerve. Dermatomes tend to overlap each other so that stimulation of a specific point on the skin typically sends afferent signals into the cord over more than one posterior root. This is functionally important since destruction of a single posterior root does not totally eliminate sensation from the afflicted dermatome. Touch can be subjectively described as discriminating or crude. Discriminating (epicritic) touch implies an awareness of an object's shape, texture, three-dimensional qualities, and other fine points. Also implied here is the ability to recognize familiar objects simply by tactile manipulation. Crude (protopathic) touch, on the other hand, lacks the fine discrimination described above and doesn't generally give enough information to the brain to enable it to recognize a familiar object by touch alone. The tactile information implied here is of a much cruder nature than described for epicritic touch. The pathways to the brain for these two kinds of touch appear to be distinct. 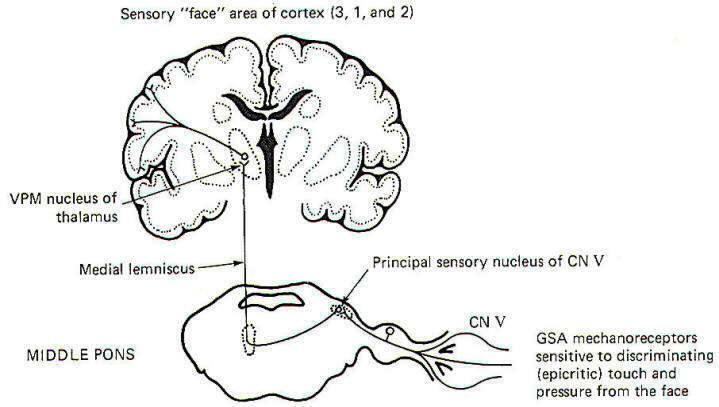 General somatic mechanoreceptors sensitive to crude touch and pressure conduct information into the cord over GSA nerve fibers (Fig-2). The fibers pass up or down a few cord segments (neuromeres) in the dorsolateral (Lissauer) tract before synapsing chiefly in laminae VI, VII, and VIII. 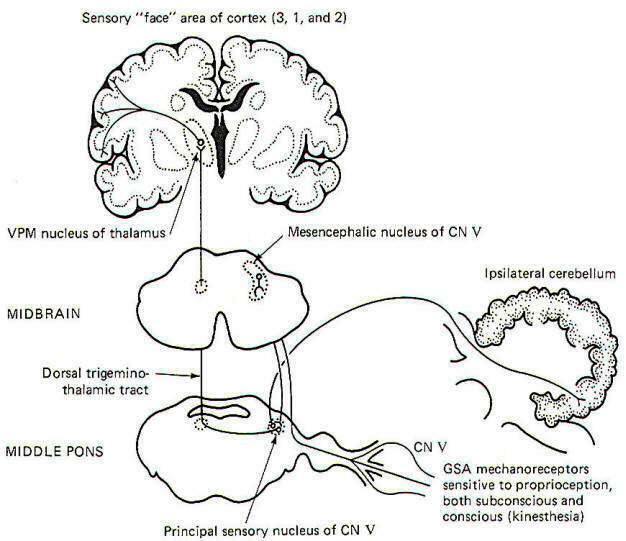 Second-order neurons cross over to the opposite side in the anterior white commissure to the anterior funiculus, where they turn upward in the anterior spinothalamic tract (ASTT) to the VPL of the thalamus. At higher pontine levels the tract also comes to lie close to the medial lemniscus as it ascends to the thalamus. Third-order neurons project from the VPL to areas 3, 1, and 2 of the cerebral cortex. Some of the ASTT fibers send collaterals into the brainstem reticular formation. While some of these no doubt ultimately reach the thalamus by reticulothalamic projections, the principal fate and function of these collaterals is largely unknown. The conscious awareness of body position and movement is called the kinesthetic sense. It's important to recognize that there are many receptors throughout the body which continually conduct information to the brain concerning the body's position and movement and even the level of muscle tone. Such receptors are collectively called proprioceptors. However, not all of these signals reach the conscious level as a large portion are conducted instead to the brainstem and cerebellum for subconscious evaluation and integration. Only those proprioceptive signals reaching the conscious level contribute to the kinesthetic sense. The kinesthetic sense and discriminating touch and pressure pathways share a common route to the brain (Fig-3). General somatic mechanoreceptors sensitive to discriminating touch and pressure and body position and movement conduct signals into the cord over GSA fibers. They pass directly into the ipsilateral posterior funiculus, where they turn upward in the dorsal columns to terminate in the dorsal column nuclei of the medulla. Those fibers entering the cord below the midthoracic level (i.e., from the lower trunk and legs) ascend through the medial dorsal column as the fasciculus gracilis and terminate in the nucleus gracilis. Fibers entering the cord above the midthoracic level (i.e., from the upper trunk and arms) enter the more lateral dorsal column and ascend as the fasciculus cuneatus to terminate in the more lateral dorsal column nuclei, the nucleus cuneatus. As might be expected, the dorsal columns include the fasciculus gracilis and fasciculus cuneatus while the dorsal column nuclei include the nucleus gracilis and nucleus cuneatus. Second-order neurons from these nuclei cross over to the other side of the brainstem in the lower medulla as the internal arcuate fibers. which then turn upward in the medial lemniscus to the VPL of the thalamus. Third-order neurons then project through the posterior limb of the internal capsule to areas 3, 1, and 2 of the cerebral cortex. Much of the proprioceptive information which reaches the conscious level giving rise to the kinesthetic sense originates in joint receptors. However, recent evidence indicates that signals from muscle spindles may also represent a significant contribution to kinesthetic sensation. On the other hand, the subconscious proprioceptive information which is shunted to the brainstem and cerebellum for evaluation and integration arises chiefly in muscle spindles and Golgi tendon organs. Most of the subconscious proprioceptive input is shunted to the cerebellum. Further, signals arising in proprioceptors on the left side of the body register on the left side of the cerebellum. By contrast, sensory signals arising in the left side of the body register on the right side of the cerebral cortex. After entering the cord, proprioceptive afferents (GSA fibers) terminate in laminae V, VI, and VII (Clarke's column) of the posterior horn. Second-order neurons (primarily conducting information from Golgi tendon organs) cross over to the opposite side of the cord in the anterior white commissure to the lateral funiculus, where they turn upward in the anterior spinocerebellar tract (ASCT). After reaching upper pontine levels the fibers cross back over and enter the cerebellum through the superior cerebellar peduncle, where they terminate in the vermis (Fig-4). Some of the anterior spinocerebellar tract fibers upon reaching the medulla remain uncrossed and enter the cerebellum via the inferior cerebellar peduncle and terminate in the contralateral vermis. Other second-order neurons (those receiving information primarily from muscle spindles and tendon organs) leave Clarke's column to ascend in the ipsilateral posterior spinocerebellar tract (PSCT) to the cerebellum. After reaching the medulla, the fibers enter the cerebellum via the inferior cerebellar peduncle to terminate in the ipsilateral cortex. Some of the subconscious proprioceptive input from the cervical region follows an alternate route to the cerebellum. Some of the fibers travel a short distance in the dorsal funiculus, terminating in the accessory cuneate nucleus of the medulla. Second-order neurons project from here as the cuneocerebellar tract to enter the cerebellum via the inferior cerebellar peduncle. Certain clinical signs are associated with injury to the dorsal columns. As might be expected, these are generally caused by impairment to the kinesthetic sense and discriminating touch and pressure pathways. They include (1) the inability to recognize limb position, (2) as­tereognosis, (3) loss of two-point discrimination, (4) loss of vibratory sense, and (5) a positive Romberg sign. Astereognosis is the inability to recognize familiar objects by touch alone. When asked to stand erect with feet together and eyes closed, a person with dorsal column damage may sway and fall. This is a posi­tive Romberg sign. 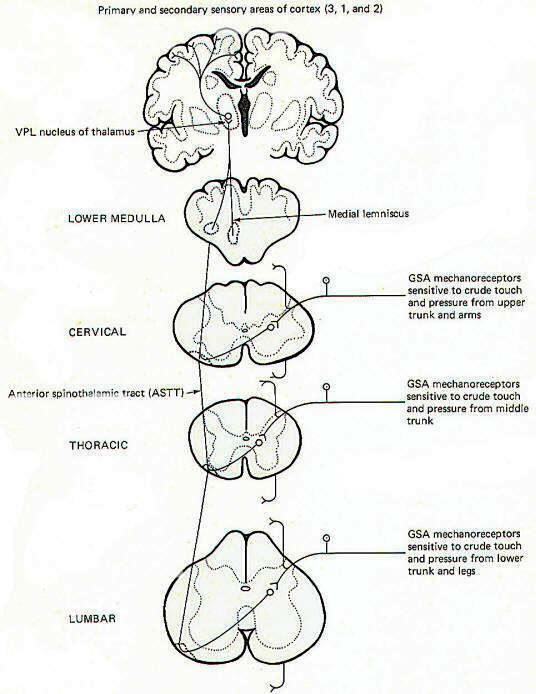 General somatic nociceptors, thermoreceptors, and mechanoreceptors sensitive to crude touch and pressure from the face conduct signals to the brainstem over GSA fibers of cranial nerves V, VII, IX, and X. The afferent fibers involved are processes of monopolar neurons with cell bodies in the semilunar, geniculate, petrosal, and nodose ganglia, respectively. The central processes of these neurons enter the spinal tract of V, where they descend through the brainstem for a short distance before terminating in the spinal nucleus of V. Second-order neurons then cross over the opposite side of the brainstem at various levels to enter the ventral trigeminothalamic tract, where they ascend to the VPM of the thalamus. Finally, third-order neurons project to the "face" area of the cerebral cortex in areas 3, 1, and 2 (Fig-5). The pathway for discriminating touch from the face is illustrated in Fig-6. 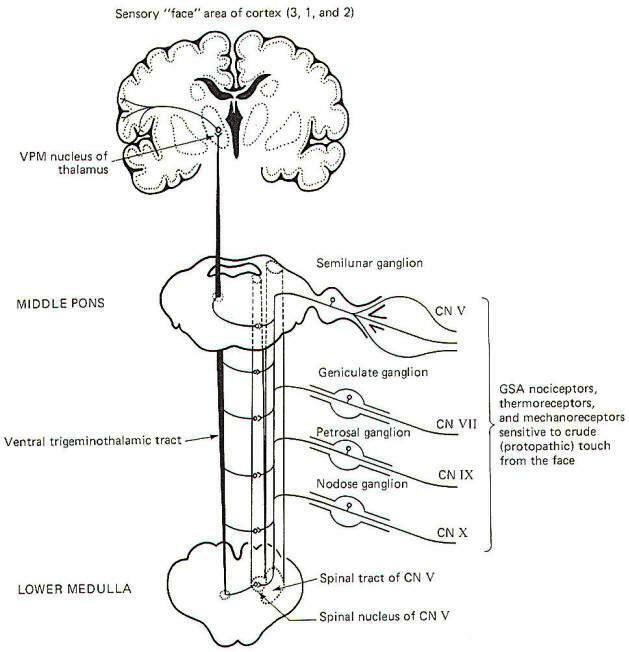 Signals are conducted from general somatic mechanoreceptors over GSA fibers of the trigeminal nerve into the principal sensory nucleus of V, located in the middle pons. Second-order neurons then conduct the signals to the opposite side of the brainstem, where they ascend in the medial lemniscus to the VPM of the thalamus. Thalamic neurons then project to the "face" region of areas 3, I, and 2 of the cerebral cortex. 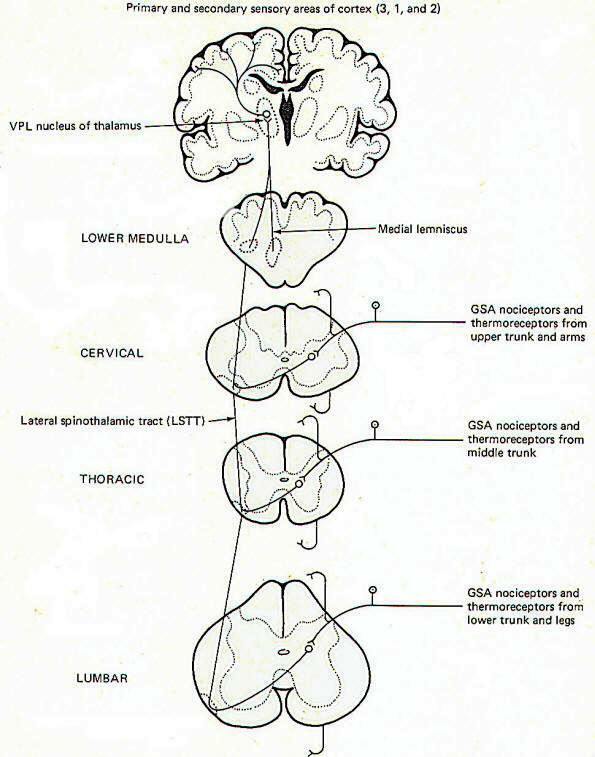 Proprioceptive input from the face is primarily conducted over GSA fibers of the trigeminal nerve. Curiously, however, the cell bodies of these monopolar neurons are located in the mesencephalic nucleus of V in the midbrain rather than the semilunar ganglia, where the cell bodies of other afferent neurons of the trigeminal nerve are located. The peripheral endings of these neurons are the general somatic mechanoreceptors sensitive to both conscious (kinesthetic) and subconscious proprioceptive input. 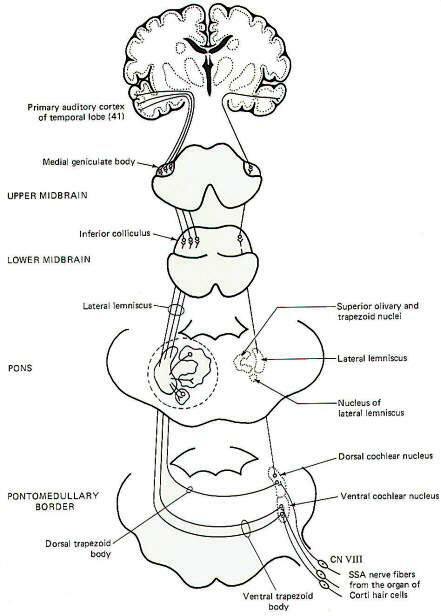 Their central processes extend from the mesencephalic nucleus to the principal sensory nucleus of V in the pons (Fig-7). The subconscious component is conducted to the cerebellum, while the conscious component travels to the cerebral cortex. Certain second-order neurons from the principal sensory nucleus relay proprioceptive information concerning subconscious evaluation and integration into the ipsilateral cerebellum. Other second-order neurons project to the opposite side of the pons and ascend to the VPM of the thalamus as the dorsal trigeminothalamic tract. Thalamic projections terminate in the face area of the cerebral cortex. The organ of Corti with its sound-sensitive hair cells and basilar membrane are important parts of the sound transducing system for hearing. Mechanical vibrations of the basilar membrane generate membrane potentials in the hair cells which produce impulse patterns in the cochlear portion of the vestibulocochlear nerve (VIII). The principles of this system will be examined elsewhere. For now we will examine only the central pathways from the receptors to their terminations in the brain (Fig-8). Special somatic nerve fibers of cranial nerve VIII relay impulses from the sound receptors (hair cells) in the cochlear nuclei of the brainstem. These are bipolar neurons with cell bodies located in the spiral ganglia of the cochlea. Their central processes terminate in the dorsal and ventral cochlear nuclei on the ipsilateral side of the brain stem at the pontomedullary border. Most of the second-order neurons arising in the cochlear nuclei cross to the opposite side of the brainstem in the trapezoid body and turn upward in the lateral lemniscus, terminating in the inferior colliculus of the midbrain. 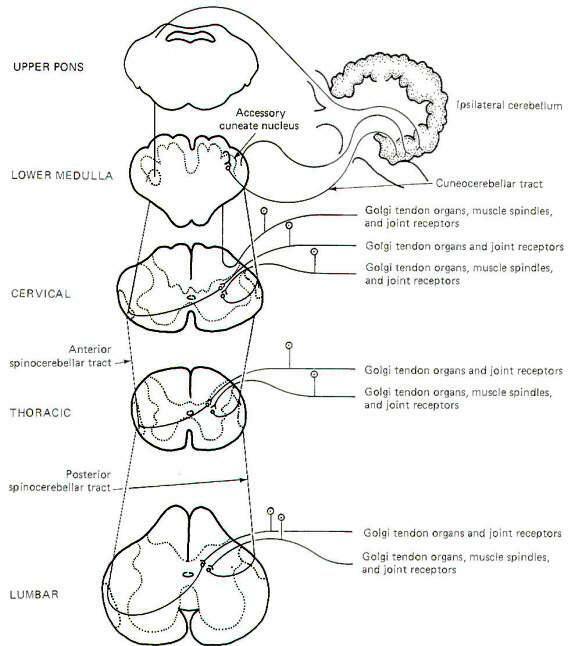 Collaterals of the lateral lemniscus terminate in the nucleus of the trapezoid body, superior olivary nucleus, nucleus of the lateral lemniscus, and the brainstem reticular formation. Fibers arising in these nuclei also ascend in the lateral lemniscus. Those fibers from the cochlear nuclei which don't cross over in the trapezoid body ascend in the ipsilateral lateral lemniscus to the inferior colliculus. Sound signals also pass from one side to the other via contralateral projections from one lemniscal nucleus to the other as well as from one inferior colliculus to the other. Thus each lateral lemniscus conducts information from both sides, which helps to explain why damage to a lateral lemniscus produces no appreciable hearing loss other than problems with sound localization. Signals are then conducted from the inferior colliculi to the medial geniculate bodies and finally to the primary auditory area of the temporal lobes (area 41). The vestibulocochlear nerve serves two quite different functions. The cochlear portion, previously described, conducts sound information to the brain, while the vestibular portion conducts proprioceptive information. It is the central neural pathways of the latter function which we will examine now (Fig-9). The mechanics and physiology of the system explained elsewhere. Special somatic afferent fibers from the hair cells of the macula utriculi and macula sacculi conduct information into the vestibular nuclei on the ipsilateral side of the pons and medulla. These are bipolar neurons with cell bodies located in the vestibular ganglion. Some of the fibers project directly into the ipsilateral cerebellum to terminate in the uvula, flocculus, and nodulus, but most enter the vestibular nuclei and synapse there. As might be expected, neuronal output from the vestibular nuclei effects bodily and eye movements in response to movements of the head as detected by the vestibular apparatus. The vestibulospinal path fibers which affect body reflexes and muscle tone in response to vestibular input originate primarily in the lateral vestibular nucleus. The medial vestibular nucleus is the principal origin of both crossed and uncrossed fibers which descend through the brain stem in the medial longitudinal fasciculus to the upper cord causing various reflex head and arm movements in response to vestibular stimuli. Finally, all four vestibular nuclei (medial, lateral, superior, and inferior) project both crossed and uncrossed fibers to the motor nuclei of cranial nerves Ill, IV, and VI in order to control and coordinate reflex eye movements. These vestibuloocular paths also travel in the medial longitudinal fasciculus. The visual system receptors are the rods and cones of the retina. The neurophysiology of vision and visual reflexes are discussed elsewhere. Special somatic afferent fibers of the optic nerve (II) conduct visual signals into the brain. Examination of Fig-10 will show that fibers from the lateral (temporal) retina of either eye terminate in the lateral geniculate body on the same side of the brain as that eye. On the other hand, SSA II fibers from the medial (nasal) retina of each eye cross over in the optic chiasm to terminate in the contralateral lateral geniculate body. The optic nerve is composed of fibers from the retina to the optic chiasm. Even though no synapses occur in the optic chiasm, the continuation of the visual pathway from the optic chiasm to the lateral geniculate body is called the optic tract rather than the optic nerve. 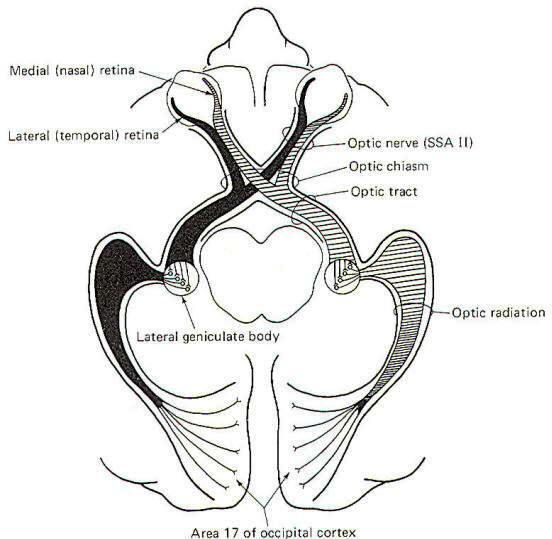 After a synapse in the lateral geniculate body, the signal continues in the optic radiation to area 17 of the conscious visual cortex. Area 17 is the primary visual area, which receives initial visual signals. Neurons from this area project into the adjacent occipital cortex (areas 18 and 19) which is known as the secondary visual area. It is here that the visual signal is fully evaluated. 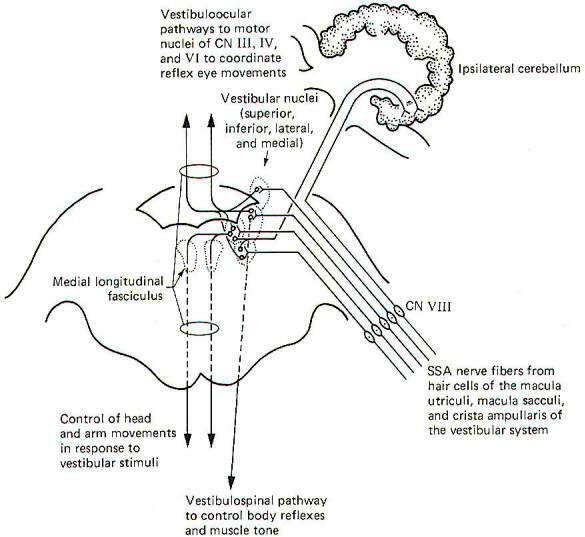 The visual reflex pathway involving the pupillary light reflex is illustrated in Fig-11. This is the well-known reflex in which the pupils constrict when a light is shined into the eyes and dilate when the light is removed. Some SSA II fibers leave the optic tract before reaching the lateral geniculates, terminating in the superior colliculi instead. From here, short neurons project to the Edinger­Westphal nucleus (an accessory nucleus of III) in the midbrain, which serves as the origin of the preganglionic parasympathetic fibers of the oculomotor nerve (GVE III). 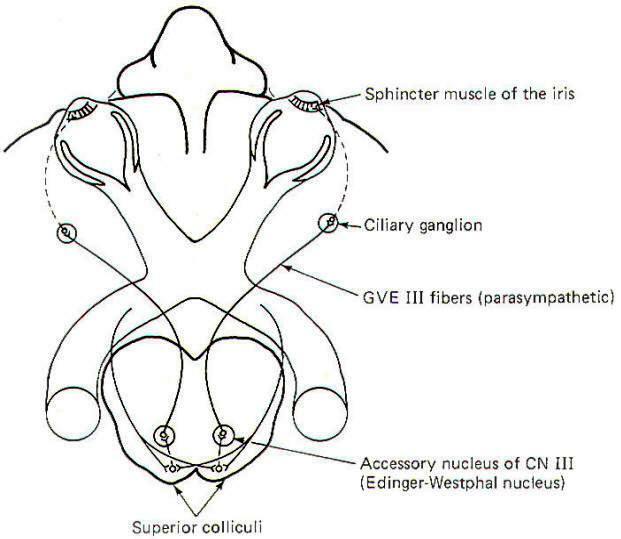 The GVE III fibers in turn project to the ciliary ganglia, from which arise the postganglionic fibers to the sphincter muscles of the iris, which constrict the pupils. Visceral pain receptors are located in peritoneal surfaces, pleural membranes, the dura mater, walls of arteries, and the walls of the GI tube. Nociceptors in the walls of the GI tube are particularly sensitive to stretch and overdistension. General visceral nociceptors conduct signals into the spinal cord over the monopolar neurons of the posterior root ganglia. They terminate in laminae III and IV of the posterior horn as do the pain and temperature pathways of the GSA system; however, their peripheral processes reach the visceral receptors via the gray rami communicantes and ganglia of the sympathetic chain (Fig­12), Second-order neurons from the posterior horn cross in the anterior white commissure and ascend to the thalamus in the anterior and lateral spinothalamic tracts, Projections from the VPL of the thalamus relay signals to the sensory cortex. The localization of visceral pain is relatively poor, making it difficult to tell the exact source of the stimuli. At least a partial explanation of our inability to precisely localize visceral pain relates to its rarity. True visceral pain seldom occurs when compared to the frequency of external pain. An additional compounding factor is the phenomena of referred pain. Because true visceral pain is often projected or "referred" by the brain to some area on the surface of the body, its true visceral origin is often confused. The mechanism for referred visceral pain is not fully understood but may result in part from the close proximity in the posterior horn of the central terminals of GVA pain fibers and GSA spinal nerve fibers from the body surface. This is supported by the fact that pain from a visceral origin is referred to a dermatome with which it shares the same posterior root. This is a useful observation, often making it possible to locate the source of a visceral pain from an observation of the surface area to which it is referred. The pain down the inside of the left arm associated with true cardiac pain is a good example. It is likely that separate second-order neurons relay pain information from GSA and GVA input. If the painful stimulus to the viscera is moderate, the level of activity in the GVA fibers is likely sufficient to stimulate only those second-order neurons which normally relay signals from the viscera. However, if the painful stimulus increases in strength, the increased central synaptic activity of the GVA neurons may "spill over" and raise the central excitatory state of those second-order neurons which normally relay information from GSA fibers of the dermatome. If the painful visceral stimulation is very strong, this "spill over" may be sufficient to exceed the threshold of excitation for these neurons, causing them to fire even though no painful stimulus is delivered to the general somatic nociceptors of the dermatome. Thus the brain incorrectly projects the source of the pain to the dermatomal area (Fig-13). The walls of the aorta and the carotid sinuses contain special baroreceptors (pressure receptors) which respond to changes in blood pressure. These mechanoreceptors are the peripheral endings of GVA fibers of the glossopharyngeal (IX) and vagus (X) nerves. 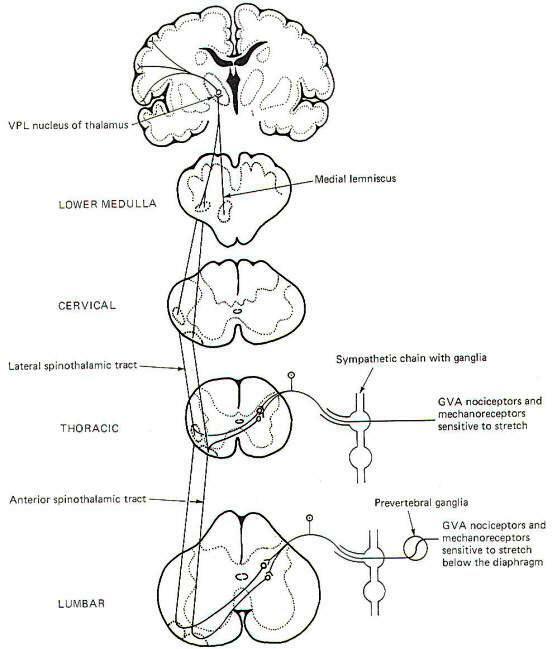 The GVA fibers from the carotid sinus baroreceptors enter the solitary tract of the brainstem and terminate in the vasomotor center of the medulla (Fig-14). This is the CNS control center for cardiovascular activity. The cell bodies of these unipolar neurons are located in the petrosal ganglion. GVA fibers of the vagus nerve conduct signals from the baroreceptors in the walls of the aorta to the solitary tract and on to the vasomotor center. The cell bodies of these unipolar neurons are located in the nodose ganglion. 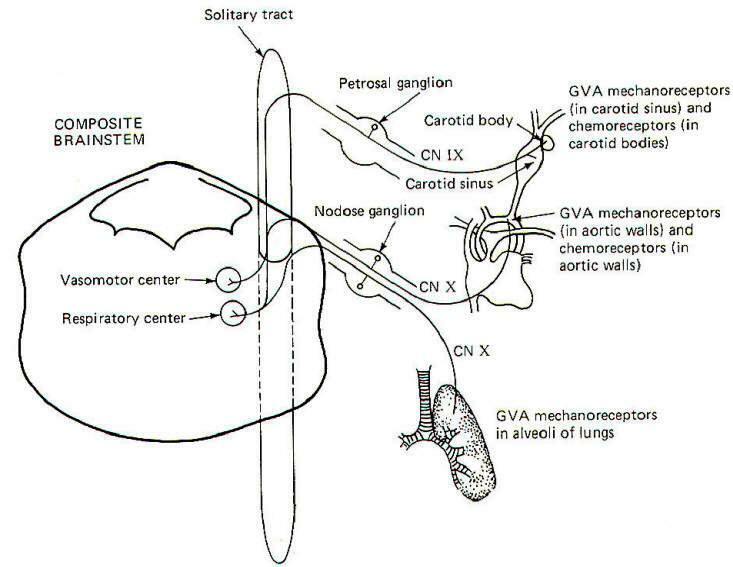 Stretch receptors in the alveoli of the lungs conduct information concerning rhythmic alveolar inflation and deflation over GVA X fibers to the solitary tract and then to the respiratory center of the brainstem. This route is an important link in the Hering-Breuer reflex, which helps to regulate respiration. Carotid body chemoreceptors, sensitive to changes in blood PO2 and, to a lesser extent, PCO2 and pH, conduct signals to both the vasomotor and respiratory centers over GVA IX nerve fibers. GVA X fibers conduct similar information from the aortic chemoreceptors to both centers. Chemoreceptors were discussed elsewhere. The receptors for taste are the taste cells which produce impulses in afferent fibers in response to chemical stimulation. They were described elsewhere. The pathways for taste sensation are illustrated in Fig-15. 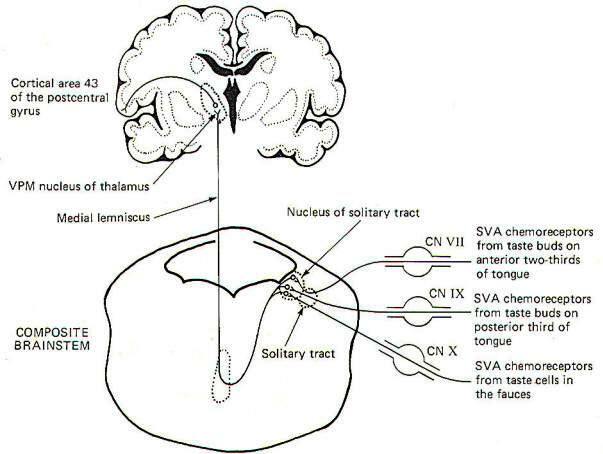 Special visceral afferent (SVA) fibers of cranial nerves VII, IX, and X conduct signals into the solitary tract of the brainstem, ultimately terminating in the nucleus of the solitary tract on the ipsilateral side. Second-order neurons cross over and ascend through the brainstem in the medial lemniscus to the VPM of the thalamus. Thalamic projections to area 43 (the primary taste area) of the postcentral gyrus complete the relay. SVA VII fibers conduct from the chemoreceptors of taste buds on the anterior twothirds of the tongue, while SVA IX fibers conduct taste information from buds on the posterior one-third of the tongue. SVA X fibers conduct taste signals from those taste cells located throughout the fauces. The sense of smell was examined elsewhere and, once again, we will look only at the central pathways here. The smell-sensitive cells (olfactory cells) of the olfactory epithelium project their central processes through the cribiform plate of the ethmoid bone, where they synapse with mitral cells. The central processes of the mitral cells pass from the olfactory bulb through the olfactory tract, which divides into a medial and lateral portion (Fig-16). The lateral olfactory tract terminates in the prepyriform cortex and parts of the amygdala of the temporal lobe. 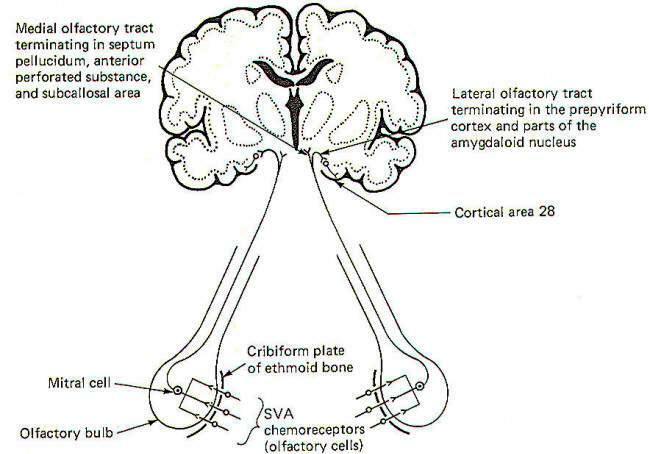 These areas represent the primary olfactory cortex. Fibers then project from here to area 28, the secondary olfactory area, for sensory evaluation. The medial olfactory tract projects to the anterior perforated sub­stance, the septum pellucidum, the subcallosal area, and even the contralateral olfactory tract. 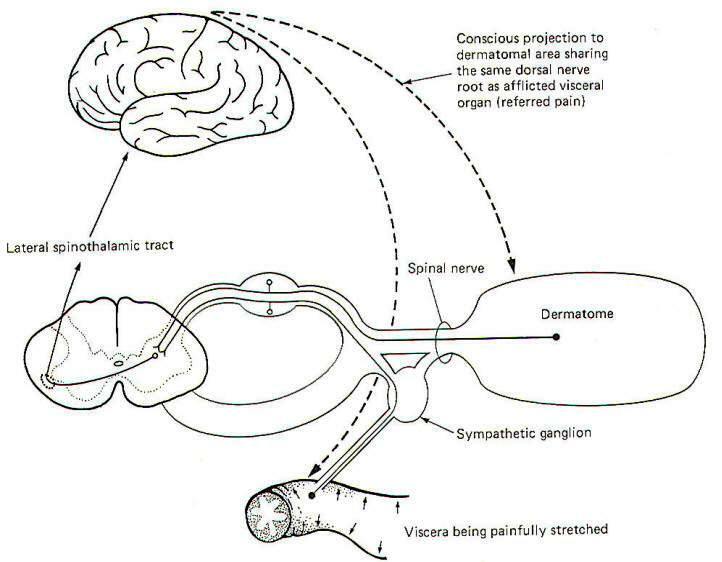 Both the medial and lateral olfactory tracts contribute to the visceral reflex pathways, causing the viscerosomatic and viscerovisceral responses described earlier. After studying the motor pathways and the sensory pathways, the injuries described in Table-1 would be expected to produce the symptoms listed. Posterior root Tabes dorsalis Paresthesia. Intermittent sharp pains. Decreased sensitivity to pain. Loss of reflexes. Loss of sensation. Positive Romberg sign. High stepping and slapping of feet. Posterior and lateral funiculi Subacute combined degeneration Loss of position sense. Loss of vibratory sense. Positive Romberg sign. Muscle weakness. Spasticity. Hyperactive tendon reflexes. Positive Babinski sign.